you are sure of a big surprise! You will find the famous Josephine Baker and mushrooms! The sign below tells us:- Josephine Baker (1906-1975) was the first black artist of international renown. A victim of racial segregation in the United Sates, she arrived in France in 1925 at the age of 19 and worked in La Black Revue. She was a resistance fighter of the 1940’s during the Second World War, she carried secret messages during her travels abroad with her troupe. She was awarded the cross of Chevalier de la Legion d’Honour. She also adopted twelve children from different continents to create her humanist ideal, which she called “Rainbow Tribe”. She died at 69 years of age after being chased from her Milandes Château which she named ”World Village and Capital of the Fraternity”. Her children were taken in by Princess Grace of Monaco, who also organised her funeral. All artistic work is by the children from the Primary School in Daglan, it is truly amazing. She is dancing on the grass in front of her children, wearing her famous bananas. The display is by the still Céou river behind the Salle Des Fetes in Daglan. An idyllic spot for a picnic. These mushrooms were found all around the artistic work. Paul and I are unsure what type of mushroom they are. So we did not pick any. If anyone knows please tell us via our blog. 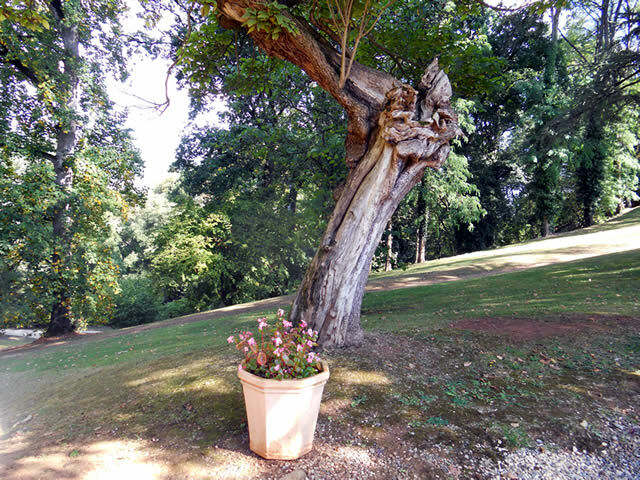 Our friend of many years, (about thirty five); came for her first visit to the Perigord Noir last week and what a wonderful time we had, catching up on the latest news from England and visiting some of the attractions of the area. There is never enough time and we were sorry to see her go last Saturday, however we were already planning her next trip while we waited for her flight at Bergerac airport, which will include vineyards and horse riding, wonderful. 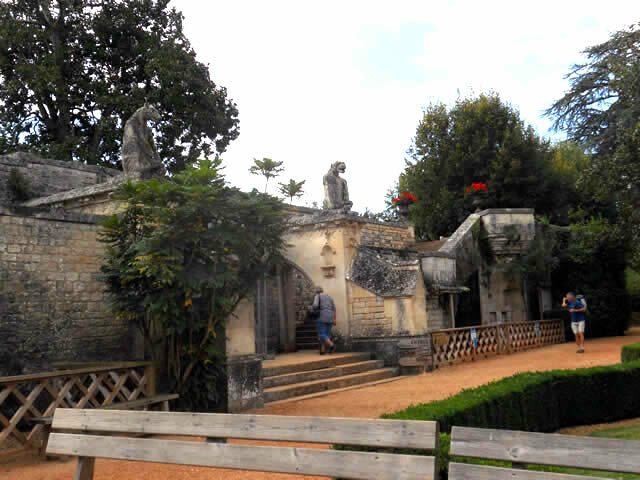 I just had to take her to see the home of Josephine Baker, Château des Milandes and its park. When we were last at Milandes last May with my sister, part of the park was being transformed, so I was particularly pleased that it was now open to the public and we could look around. In the 1900’s Charles Claverie had the entire park laid out by Jules Vacherot who was the landscape architect in Chief of Paris at that time. Through Jules Vacherot guidelines the park was then set out into a large grid with lawns, terraces, balustrades and sculptures to create and enhance the park. Since 2003, a succession of works have been completed such as boxwood hedges surrounding the terraces and flower garden at the front of the Château. In the spring of this year work was started on the “Renaissance” of the Château and the park. The restoration of Jules Vacherot park now blends the Renaissance Period, with Art Nouveau and the Modernism periods together. One fascinating thing that I had missed on previous visits to Milandes was the bell at the front of the Château. Unsure what it could be used for I imagined sitting in the garden and ringing the bell to summon tea or perhaps is was a fire bell? How gorgeous is this? It certainly has the Wow factor. Cascading water features and the infinity pool. This fountain is to be found on the right of the new garden with excellent seating area to relax for a few moments shaded from the sun. This is Monsieur Steene the Chief Falconer at Milandes with one of the protected birds of prey that he presents several times a day until the end of October. I love the moustache on this little bird. The falconers look after about seventy birds of prey at Milandes and their shows are always a treat to see. This is a new bird which has been added to the collection of birds of prey. We do not recognise the bird, if anyone can tell me please I would be very grateful. It hopped and ran alongside the falconer and only flew when it could not keep up. A visit by my wonderful sister is always a treat after a thirty year separation; the more we see each other the more we find out that we have a vast amount in common. 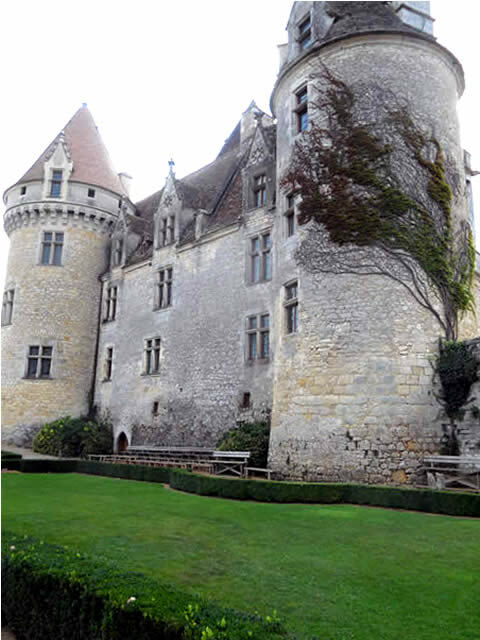 One of which is our love of gorgeous Château’s, so we had to take her to see Château des Milanders. I fell in love with Milanders from our first visit years ago and it never looses its charm. It was called “Sleeping Beauty Castle” in 1937 when Josephine Baker first looked at the Château, so it comes at no surprise that she rented and then purchased the Château in 1947. A visit to the Château is like a journey through the genius of Josephine Baker, who lived with her husband, Joe Bouillon and their twelve children, adopted from all over the world. Through the fourteen fully furnished rooms you can see the famous “banana belt” and the magnificent costumes of Josephine’s stage performances. Not forgetting the very “diva” bathrooms that were designed just for her, one of which has gold leaf around the ceiling. What is not commonly known is that Josephine worked extensively in the French Resistance and she was awarded various medals, one of which was the Legion of Honour. She was a passionate campaigner for human rights walking along side Martin Luther King in his various marchers in the USA. My sister and I with Château Milandes in the background, we were not saying cheese to the camera, but saying “this is our home” – well maybe if we win the lottery, who knows. 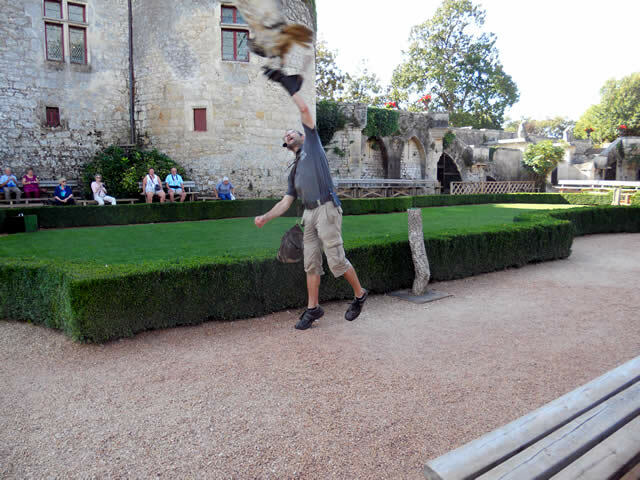 One of the highlight’s of a visit is the birds of pray demonstrations held in the garden at the rear of the Château. A magnificent falcon which flew around our heads several times before he got his treat, wonderful. Here is my sister admiring the statue of Josephine Baker giving a hug to one of her children. The statue was unveiled in 2006 for the centenary of the birth of Josephine. It is to be found in front of the bus shelter that Josephine had built for the children to shelter while they waited for the school bus to arrive. In the bus shelter are pictures of Josephine and her husband with their children. The letters are from famous people to Josephine, one of whom was Charles de Gaul. Events: – Daglan this Saturday and Sunday for the Antique Fair. 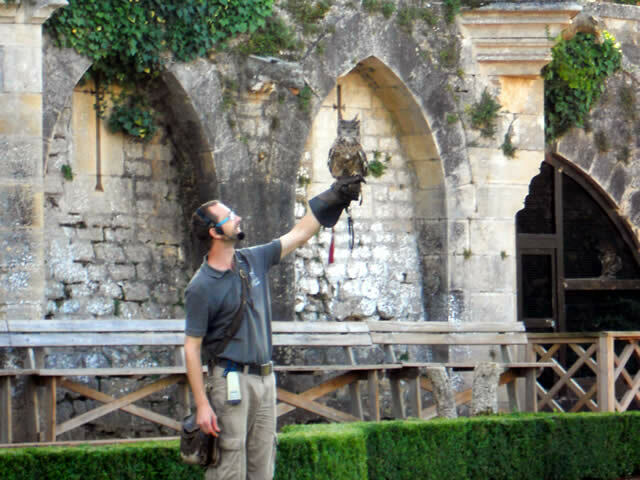 One of the highlights of Milandes is the Raptors Demonstration, which is found to the rear of the Château most afternoons from April until November and mornings too in mid summer, see the website for opening times. We first watched the demonstration on our first visit to the Perigord in 2009 it was a cold and damp day in the autumn, but the demonstration was superb. This time it was a gorgeous sunny day with not a cloud in the sky, so we sat outside and looked up at the Château while we waited for the demonstration to begin. The rear of Milandes showing the seating area. I love gargoyles and these two are a superb example, as they tower over the many cages below them. Some of the large cages set into the walls house raptors. The Eagle Owl in flight, this was a year old female which weighed three kg and has a wing span of 1.80m. It comes to get a reward of chicken after each flight. Spotted Eagle Owl, it is one of the smallest birds at Milandes. Its wingspan is about 1.40 metres and her weight is about 750 grams and she is a little cutie. There are also American Eagles, Falcons, Kestrels and Harris Hawks to name but a few of the birds of pray. Which are housed in cages in the park area of Milandes. Needless to say it was a superb demonstration; the highlight for me was when the Eagle owl flew onto my arm, it was heavy, but fortunately for me so well behaved.